Using WEtap’s TopLayer™ product, FTSI was able to make Rivermark’s secure email and mobile chat features have the look and feel of Rivermark’s own site, as well as making both features accessible by smartphone. “Enhancing member satisfaction and loyalty by improving the usability and ease of use of our online services is a top priority at Rivermark,” said David Noble, Rivermark’s VP of Marketing. 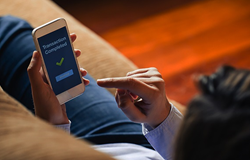 Rivermark Community Credit Union announced last week that it has successfully upgraded its Online and Mobile Banking system to a new brand-integrated platform thanks in part, with help from WEtap and FTSI. Rivermark’s out-of-the-box secure chat and secure email software have a brand-consistent look-and-feel, because of TopLayer™. Using WEtap’s TopLayer™ product, FTSI was able to make Rivermark’s secure email and mobile chat features have the look and feel of Rivermark’s own site, as well as making both features accessible by smartphone. Additionally, FTSI was able to use TopLayer™ to enhance Rivermark’s desktop banking platform so that secure chat and secure email was also consistent with Rivermark’s branding. “WEtap’s TopLayer™ gave us options to solve problems that we wouldn’t have been able to solve otherwise, allowing us to provide our members with mobile registration and mobile chat without moving our launch date,” said Robert Mills, Rivermark’s VP of Technology. Many banks and credit unions have to use third party applications that force users to leave their financial institution’s site which can cause confusion. With TopLayer™, financial institutions are able to brand these third party sites to look like their own, providing a branded, familiar, and seamless user experience. Rivermark continues to set the standard for state-of-the-art banking experiences and FTSI and WEtap are proud partners in that effort. FTSI is an NCR Elite Partner and the largest independent provider of ATM services for credit unions and community banks in the Western U.S. Established in 1998, FTSI offers a comprehensive suite of cutting-edge ATM management and maintenance solutions and specializes in branch transformation and delivering omni-channel solutions. For more information please visit http://www.ftsius.com. WEtap Media is an American company doing amazing things to transform businesses’ digital platforms. WEtap delivers mobile, social, live streaming and web applications to help companies reach customers in new and engaging ways. For more information please visit http://www.wetap.com.